NJA continues arranging for exchange of visits of journalists delegations between Nepal and other friendly countries of the world. 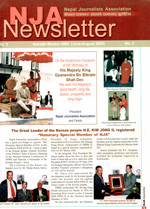 In liason to a number of measures adopted by the NJA in regard to promote the well-being of the journalists, it is under the auspices of the NJA that Nepalese journalists has an opportunities to visit several countries of the world as well as NJA has been able to welcome foreign journalists to its land. It has been one of the important objectives of the NJA to organize such exchange visits between the journalists all over the world. 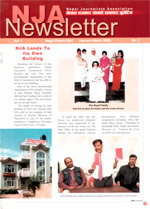 Launching of NJA's web site. Free blood donation to ailing journalists and their families. Arrangements of free food and lodging for journalists visiting Kathmandu from different parts of the Kingdom for three days. Arrangements to provide financial assistance to sick journalists. 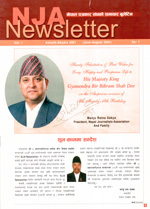 Collecting payment of advertisements published in newspapers of the regions in Kathmandu from various government and private enterprises and sending the same to the concerned newspapers. Celebration of national occasions including the Constitution Day and World Press Day, etc. NJA has been organizing breakfast meeting every Saturday since 1990 in Hotel Ambassador. Now NJA has shifted this Saturday breakfast meeting regularly at its new house at Kalimati, Kathmandu. NJA heartly request to all the journalists to come and join in this Saturday breakfast meeting. 2. Establishment of NJA Printing Press at its own building to serve to the journalists in printing their newspapers at the subsidized rates. 3. Free Health Check-up to the journalists.